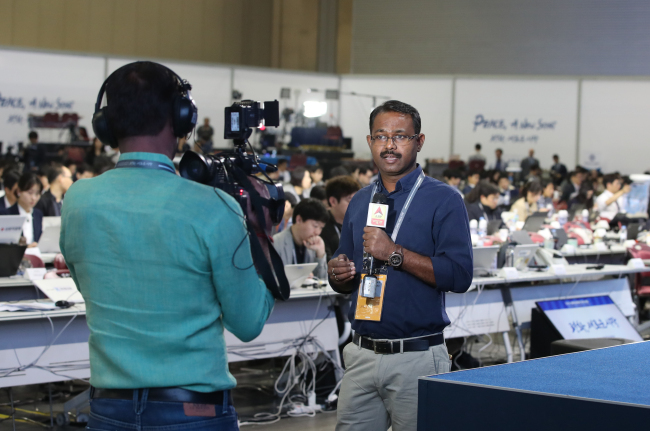 With South Korean President Moon Jae-in and North Korean leader Kim Jong-un set to meet Friday, nearly 3,000 journalists from all around the world packed the main press center set up in an exhibition hall in Goyang, Gyeonggi Province. A sense of excitement was palpable among reporters here covering the event, which will be the first inter-Korean summit in 11 years, and follows a year of tension heightened by the North’s nuclear and missile provocations. And most of them were looking out for what implications the result of the inter-Korean summit would have on the upcoming meeting between US President Donald Trump and Kim in May or in early June. “Last year, we spent so much time, so many Saturday mornings on North Korea’s missile tests and Trump tweets about ‘fire and fury’… I think it is quite surreal now to be in the position where two Koreas are being nice to each other. I think it is a progress,” said Oliver Hotham, a British reporter working for Seoul-based outlet NK News. 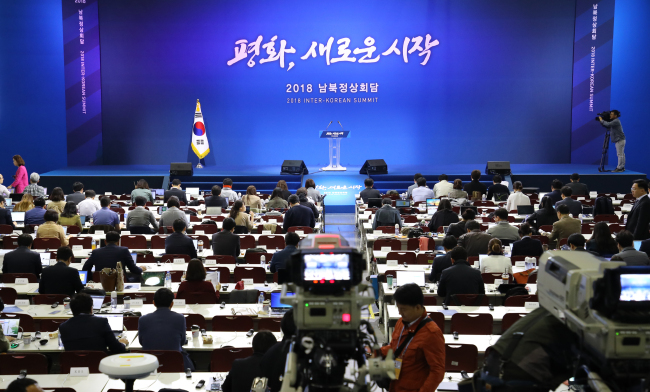 The main press center opened on Wednesday afternoon in the Korean International Exhibition Center, about 30 kilometers from the Peace House in the truce village of Panmunjeom, where the summit will be held. There was also a sense of optimism about a breakthrough from the inter-Korean summit. “When the second inter-Korean summit took place in 2007, there was skepticism because the presidential election was only two months away. It was already quite clear that a conservative President Lee Myung-bak would take office, so there were doubts about whether the agreement could be implemented,” said a local reporter, who has covered the 2007 inter-Korean summit between late President Roh Moo-hyun and Kim Jong-un’s father Kim Jong-il. “But now is different. North Korea is very proactive about the inter-Korean summit and the inter-Korean summit is happening in the early stage of the Moon administration,” he added. Reporters from various countries had differing focuses regarding the inter-Korean summit. Neeraj Rajput, who works at India-based ABP News Network, said that he hoped that good relations could be formed between the two Koreas during the summit. The press center has over 1,000 seats -- about 550 for local reporters, 360 others working for foreign media and extra seats -- in the main briefing room, where briefings by the presidential office’s officials were held. It will be open until Saturday morning. As the two Koreas agreed to broadcast live key events of the inter-Korean summit, from the moment Moon greets Kim on the border to the two leaders shaking their hands, the reporters will be able to watch it from large screens set up at the front of the briefing room. A total of 2,850 media crew from 460 news outlets in 41 countries have formally signed up to cover the historic event as of April 24, according to the presidential office. Among them, 869 are foreign reporters. Japan sent the most reporters -- 366 from 25 news outlets -- followed by 141 from 28 American outlets and 81 from 21 Chinese outlets. 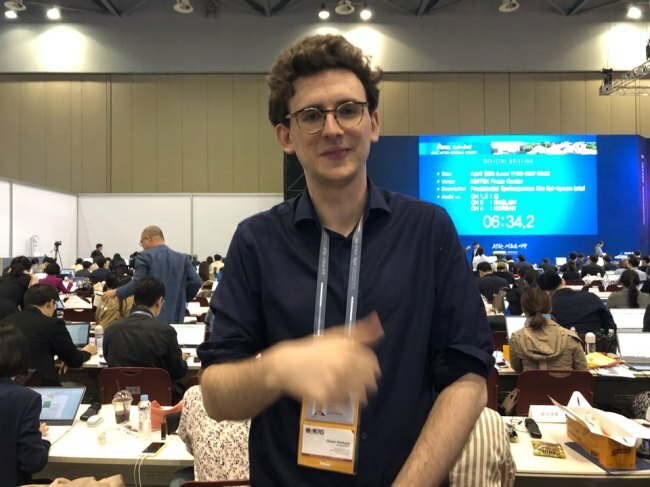 Fifteen countries – including Austria, Thailand and India -- have sent reporters for the first time to cover an inter-Korean summit. Argentina, Cameroon, Bulgaria, Finland, Ireland and Iran each sent one reporter to cover the summit.